A strange and overwhelming feeling is felt in Prague. Magic and mystery; that mystery excites but does not scare. Every corner, every monument and every corner of the capital of the Czech Republic are accompanied by a legend, a fable, stories of ghosts, prophecies, witches and evil spells. Walking through the streets and adventures at night in Prague – although it sounds cliched – gives the impression that the city was enchanted. 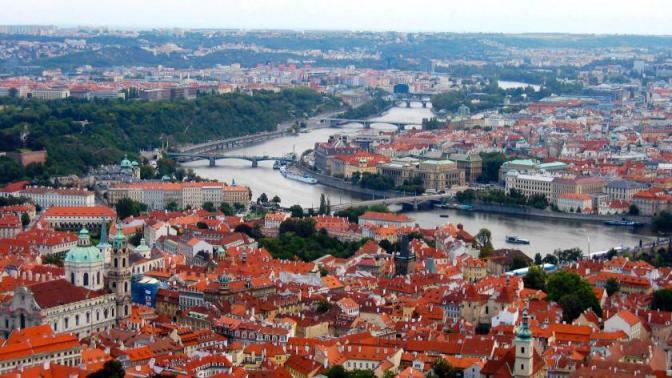 “But where do the charm and beauty of Prague come from? What is its secret? What is the origin of the unexplainable supernatural?” wrote the famous Czech writer Jakub Arbes for all those things that apparently happen here. As if it were not enough with all the beauty of a city proclaimed World Heritage and recognized as one of the most beautiful not only in Europe, but in the world. Walk and lose yourself aimlessly through the streets of Prague, contemplate a sunset over the Vltava river or cross it on a cruise, climb the Petrin tower to enjoy the best panoramic view of the city with its orange towers and roofs – among many plans and more places- it’s a fascinating experience. But it will be better with the narration of all those things that have happened in its more than twelve centuries of history. “I see a great city whose fame will touch the stars”, says a prophecy that represents that close relationship between the Czech capital and astronomy. And precisely that prophecy is attributed to the fact that Prague got rid of all the great wars and catastrophes that Central Europe has suffered; perhaps that is why it is still preserved unique, almost intact. The Charles bridge, 516 meters long and ten wide, and whose construction took more than 150 years, is considered the largest and longest gallery of statues in the world; it crosses the Vltava River and connects Stare Mesto (The Old City) with Nove Mesto (The New City). There are 30 statues that adorn both sides of the bridge – of Baroque and Gothic styles – that seem to greet travelers. The castle is a complex of 570 meters long and 130 wide that has survived fires and several owners and guests: from the kings of Bohemia, the emperors of the Holy Roman Empire, the presidents of the former Czechoslovakia and those of the Czech Republic. The St. Vitus Cathedral – with the tongue piece of San Juan Nepomuceno – and other places that must be seen between museums and gardens. Like the Golden Lane, a charming alley that King Rudolf II of Hamburg ordered in the 16th century for his guards and other servants. In spite of the fact that, the legend says that the king brought together the best alchemists so that seemed of gold until the last of the corners. The alley, abandoned in other times and recovered since 2011, looks like the setting of a fairy tale, with colorful houses and tiny doors, as if to goblin refuge. There, besides the servitude, goldsmiths, astronomers, intellectuals, writers and even fortune-tellers have lived. One of its most famous residents has been a certain Franz Kafka, in the house 22, with blue walls. It is unmissable to take a photo in the abode of one of the most influential writers of universal literature. Today, in the eleven houses of the alley there are shops that sell the famous and beautiful Czech crystals, puppets and other handicrafts; others are museums with armor, swords and other pieces. Leaving the castle and after crossing the bridge, towards the Old City, you reach the Prague City Hall. There is another place full of magic: Astronomical Clock. Built more than 600 years ago and considered one of the wonders of the world in the Middle Ages, it gathers hundreds of tourists who surround it minutes before that marks the hour. And there begins its show, with a skull that touches a bell, on the right side of a large sphere (astronomical quadrant in the form of the ancient astrolabe), with paintings and representations of the sky and the Earth, the zodiacal ring, the sun. And after the bells of the skull, death, begins the parade of animated figures of the twelve apostles, side by side with statues that make allegories of vanity, a man with a mirror to greed – a merchant with a saddlebag – and lust, a Turkish prince with his mandolin – an instrument similar to a guitar. The ingenuity, cardinal sins, condemnation and salvation in a device that could not be rid of legends. For example, the one that says that to his famous inventor, the watchmaker Jan Hanus, the city councilors sent him to blind – the fixation of a dagger in both eyes – so that he would not build any other similar jewel in any other European city. Therefore, blind man asked permission to activate the watch for the last time. And, they say, it had the opportunity to damage a lever that only 500 years later they managed to set to work again. And so, Prague captivates or bewitches with its stories. More missing. On the roof of the church of Santiago Mayor hangs a mummified arm on a hook of those butchers. They say it belonged to a thief who tried to steal jewelry that adorned a statue of the Virgin Mary. Also a rider without a head and a creature without soul or brain (the Golem), which protected the city from enemies during World War II. These and other stories are recreated in the Ghosts and Legends Museum, near the Charles Bridge. Although he does not own any special legend, the Jewish cemetery in Prague does generate a special energy. Built in 1439, houses about twelve thousand tombs – piled one on top of the other – of some one hundred thousand people. It is said that all those tombstones have several reasons: the lack of space would have forced to bury some on others, or simply the Jewish rule that prevents removing the oldest graves to give space to new. “Yeah right. Prague is a city with a ‘vibe’ all weird. The city bewitches and one does not know why. It is a beautiful and tender city, like a girl, but hard and dark at the same time”, say the Colombian Lucas Giraldo, who came to study several years ago and stayed to live. Sure, delighted with the beautiful Czech women, but also for that inexplicable magic.